They disclosed some important details about their tablet-optimized version of an android. We have listed some of the features from the announcements of the today’s event which have been previewed in honeycomb. Homescreen is much more customizable and features a new dedicated button for the multi-tasking. The homescreen also features a notification bar, system status while the rest of the screen is left for the apps. Notifications aren’t intrusive at all. They can also be used to control background apps. Since honeycomb is primarily a tablet based OS and has only been showcased yet on Xoom, one of the most important targets for the android team was to make sure that all exisiting apps run flawlessly on tablets. The team has spent considerably huge amount of time to make sure of that. If the apps follow the recommended guidelines, they will run really good on the honeycomb. A fragment is part of an application that can be reused through out the app to perform specific funtionality. It makes the system more modular in nature. The application fragments were explained by using the Gmail app for the honeycomb. Tapping the message slided the left most pane out to make room for a new pane, the message. Part of the app framework, this new feature allows you to create and manage dragging intereactions as per your wish. They are added to support richer touch based user interface. These are the generic drag-and-drop APIs. 2D and 3D graphics are optimized for the honeycomb. All the 2D graphics can now be hardware accelerated. New framework has also been introduced for the animation. Honeycomb will support multiple cores. 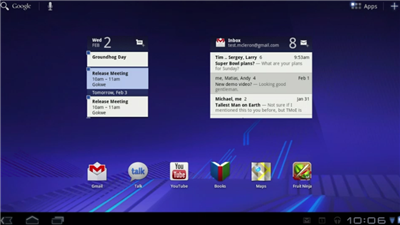 It was previewed on a Motorola Xoom which has dual-core ARM-based Tegra 2 chipset. With that, the first game for android that works hundred percent on 2 cores, Great battles Medieval, will be released. The market now provides plenty of methods to discover and purchase apps. The web store has also been launched which can directly be accessed through tablet’s browser to make the purchases. The market also offers advanced search with filters like device compatibility, paid, free etc. Developer and buyer can have different currencies which means buyer currency support is coming to the market.